Attention bloggers: There's now no reason to ever again wear pants. The SportRobe is here! 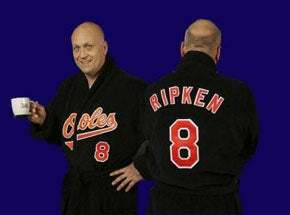 (No truth to the rumors that the Orioles are using these as their actual home uniforms). Several models available; and we suppose that Marbury is wearing his pretty much constantly. And Seaver, of course, routinely goes commando underneath his. Or so we've heard. And do you suppose that Pennington wears his during games? That would be awesome, to see his robe flapping in the breeze as he scrambles out of the pocket, revealing Hello Kitty boxer shorts and socks suspenders. That would explain so much. • Mop up all the blood. The cops will never know! • Sports themed parties at Hef's. • Reenact all the scenes in Cuckoo's Nest. We want the World Series, nurse Ratchett! • You are Moses, and your bathtub is the Red Sea. • El Guapo model comfortably fits two for Sunday morning snuggling. The first Presidential candidate to be seen in a SportRobe gets my vote for sure. (Offer not good for Fred Thompson).